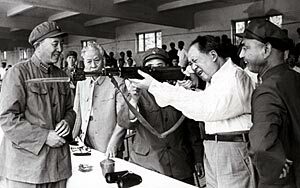 "Political power comes out of the barrel of a gun," Mao Zedong infamously said. This was true in the civil wars Mao fought and was too often true in the lawless way he oppressed his people. It is generally true in the anarchy of international relations, and would be true for individuals if they lived without law. People of practically all political stripes agree that the problem of force is one of the most important political problems, and I suspect most would agree with me that it is the most important problem. It is also the central problem addressed by the law. We can start to understand both law and politics by understanding a bit of the highly evolved common law in a situation that lies close to anarchy: the obligatory gunfight in the old Western movies. With my habitual lawyerly habit of "issue spotting," I've noticed how the good guys in these old Westerns almost always, if often barely, follow the common law of self-defense. The white hat waits until the villain reaches for and grabs his gun -- showing intent to shoot -- before he grabs his. This heroic habit illustrates one of the great summaries of the substance of the common law -- namely "thou shalt not initiate force" -- or, in a more peaceful setting, fraud. If one had to summarize the substantive parts of the common law into one sentence, that would be it -- "thou shalt not initiate force or fraud." This is not to say that one can logically deduce all important parts of law or politics from such a principle -- a common mistake of ideologists. One can no more deduce the content of the law from simple principles than one can deduce the specific sequence of an animal's genetic code from any few simple rules. Both, in mathematical terms, have an irreducible Kolmogorov complexity and any of these kinds of summaries are quite lossy. But it does turn out that almost all of the substantive common law operates in close proximity to that libertarian principle. There are some other good ways to summarize the common law. "The right to be left alone" is a good brief description of our rights under criminal, tort, and property law -- in other words these are generally systems of negative rights rather than of positive rights to compel another person's affirmative effort. Since we often don't really want to be left alone we also have contract law, which generally operates according to the principle of "keep your promises", inheritance law, "respect a dying man's wishes, and if you don't know them he meant to leave his wealth to his family," and so on. Back to our movie: let's say we come into the theater just as our hero is firing his gun. He has already drawn his gun while the villain is still bumbling around. Our hero shoots first and our villain crumples to the ground. If we didn't know this was an old Western, where the hero always draws faster despite drawing second, a reasonable guess would be that our killer was able to shoot first because he drew first, and is thus a murderer. Only in full context do we see the initiation of force and a response to it. In isolation, the response to force is often indistinguishable from the initiation of force. We often can't know for sure whether an act of coercion is an unlawful initiation of force or a lawful response to it until we've seen the entire film (and in modern Hollywood, not even then, though I digress). Or, to change metaphors and introduce a bit legalese, we often don't have probable cause to believe someone has initiated force until we've assembled some pieces of the puzzle. Learning to some even greater degree -- clear and convincing evidence in some private cases and beyond a reasonable doubt in criminal cases -- who initiated force requires even more pieces. Furthermore, to achieve justice -- to deter, to exact retribution, to make whole the victim, or to heal the sick criminal, whichever one or more of these we take to be the goal of justice -- we must almost always respond to force with force. Taken in isolation that response will itself look like an initiation of force. Furthermore, to gather the evidence we need in most cases to achieve sufficient high levels of confidence -- whether balance of the probabilities, clear and convincing evidence, or beyond a reasonable doubt -- we often have to initiate force with third parties -- to compel them to hand over goods, to let us search their property, or to testify. If politics could be deduced this might be called the Central Theorem of Politics -- we can't properly respond to a global initiation of force without local initiations of force. (2) Learn enough, without responding with force of our own, until we have probable cause to believe an initiation of force has occurred. (3) Respond with our own force in order to arrest the persons, valuables, and evidence involved, and engage in the trial(s) and other procedures necessary to convince those most highly knowledgeable about the case, and if it is important enough the world generally, that an initiation of force indeed occurred. (I'm neglecting, of course, the controversial issue of preventing force by initiating force -- in the international context by invading Iraq to prevent supposed weapons of mass destruction, in the individual context by capturing a terrorist before they've actually committed an act of terror. This is dangerous territory that goes beyond the general responsive workings of legal procedure, and will be hopefully a topic I address another day). In Hollywood our hero has a quick eye and thereby instantly achieves probable cause that our villain has reached for his gun and is threatening to fire. In reality, the evidence is usually far more dispersed and we must be far more careful, lest our supposed response to force actually be an initiation of force. Since force is the central problem of politics, a political system, whether proposed or real, that cannot distinguish an initiation of force from a proper response to force -- that cannot distinguish an arrest of a person from a kidnapping, an arrest of goods from theft, and so on -- is worth less than the paper it's written on. And if it merely waves its hands and invokes the magic of "the government" or "the market" to solve all such problems, it is extremely lame -- and quite at odds with how our highly evolved common law legal procedures actually work. The common law does not, as the law of self-defense suggests, necessarily require "the government" for a legally forceful response to force. But neither, as we shall now see, do its legal procedures operate in any way resembling the laws of economics in a voluntary market. Recall our Central Theorem of Politics -- we can't properly respond to a global initiation of force without a local initiation of force. We could deduce, if law could be deduced, that legal procedure thus might be full of local initiations of force -- and in fact it is. Legal procedure, in sharp contrast to good substantive law, does not involve merely negative rights "to be left alone," but in addition is full of positive rights. It is full of procedures for interfering with persons and property, both with the defendant who might have initiated force and with some third parties who are not accused of initiating force. The right to sue, for example -- necessary for the enforcement of any private substantive right -- is a bundle of positive rights that usually includes the right to compel a jury to sit and the right to compel witnesses as well as a right to compel the the alleged initiator in various ways. Proper response to the initiation of force would be extremely and quite unreasonably hobbled without these coercive mechanisms, these positive rights of legal procedure. And unless the disputing parties have arranged things ahead of time, the exercise of jurisdiction by our "responder to force," the court, is involuntary for at least one of them. Often the responder has to be backed by some kind of police force, or an extreme cases even an army, if justice is to be achieved. It is preventing the abuse of all this power -- including figuring out ways to minimize the power without overly reducing our ability to resond to force -- that is the central problem of politics. Ideological purists can whine all they want about the supposed injustices of the coercion inherent in legal procedure, but "thou shalt not initiate force" is merely a useful summary of the substantive common law and in no way provides a useful summary of the procedural common law, much less a principle for its operation. The job of legal procedure -- and of good politics generally -- is to respond to initiation of force with its own local initiations of force in order to achieve justice: to punish the initiator of force and to provide restitution to his victim. Whatever form this response might take -- whether a nation-state making war or enforcing law through its courts, or parties who have previously agreed resolving their dispute through a private court, or a shopping mall security guard arresting a shoplifter, or our quick-draw Western hero -- whatever form response to force may take, it is crucial that law carefully defines the proper ways for making such responeses and that we put limits on these methods to prevent abuses. It's also crucial to realize that any princples by which we might do so will tend to be very different than those of the substantive law being enforced. A recent discussion has inspired me to articulate my own design for better government, long simmering in the back of my head and in various scribbles. My focus is on the "action end" of government where disputes are resolved and laws enforced, namely what in modern democratic systems we call the judicial and executive branches. Indeed except for the Articles of Incorporation, which is the constitution of Juristopia, its laws evolve mostly by the common law method of precedent. Subsidiary organizations are free to pass bylaws if they wish, as long as they do not contravene Juristopia's own Articles of Incorporation or disobey an Order of the Extraordinary Court. There is very narrow legislative role for the Board of Franchisors which will be stated below. The main democratic element is juries, which play an important role in limiting the exercise of governmental powers. (1) There are N Rings, where N is odd, say 9. Any Ring in the possession of an individual who possesses another Ring has no power (that includes the first Ring possessed -- the second renders the first impotent -- so that there is a strong disincentive to accumulate Rings). (2) To operate the ring, a quorum of holders of the Rings, called the Court of Extraordinary Justices, touch their Rings together and prouounce the unique name of an individual to be punished for Contempt of Court, and pronounce a punishment. (4) The Rings confer on their wearers complete invulnerability to any kind of violence. There is no other magic of any sort in Juristopia. Like the Catholic College of Cardinals, the Extraordinary Justices choose their own successors. Board of Franchsisor members also choose their own successors, but have no Rings. Combined with the magical Rings, self-succession allows the Extraordinary Court to avoid the two main sources of political bias and pressure from other branches of government they now face: from their initial appointments by other branches, and by the ultimate ability of an executive branch to ignore a court order that it despises. An executive officer who refuses to execute a Court order is punished with Contempt of Court; the Rings insure that no rebellion against such punishment is possible. The Articles of Incorporation state that the Court of Extraordinary Justices exercises only a very narrow jurisdiction, called the Extraordinary Jurisdiction. All Ordinary Jurisdiction, and all armed forces and police powers besides the Rings, are auctioned off to the highest bidder as franchises. Franchises are property rights to exercise certain narrowly defined governmental powers, subject to limitations on the monopolistic fees or taxes they may charge, determined by juries selected by lottery from the feepayers or taxpayers. A number of general kinds of franchises are specified by the Articles: public nuisance suppression, fraud suppression, armed forces, police forces, and common law courts are the five main categories of franchises, but there is a vast variety of possible jurisdictional "boundaries" for franchises within each category, and ownership of franchises may be bundled within or across boundaries in a dizzying variety of ways. The franchise market can thus assemble bundles that best persuade juries of feepayers to maximize fees. Each franchise collects its own monopoly fees from all persons within its territory; no franchise may charge fees that are more than what a jury considers "reasonable", including a reasonable profit. The general franchises stated in the Articles can be subdivided and narrowed, but not expanded, by the Board of Franchisors, which can pass bylaws that specify the subject matter and personal jurisdiction and territorial boundaries of each franchise. Some franchises are executive (similar to government agencies), and some are judicial (courts). The Board, like the Court, selects its own successors. The Articles of Incorporation state that Juristopia Corporation itself does not have shareholders and may not earn a profit. Its only officers are members of the Board and Court, and the salaries of these are limited to salaries deemed "reasonable" by juries chosen by lottery from among Juristopia' taxpayers, as are its overall budget and the fees (taxes) it may charge within the territory of Juristopia. Its officers and employees may legally only engage in the business of Extraordinary Jurisdiction (Court) and writing initial franchise deeds (Board) -- they are are forbidden from engaging in ordinary business or Ordinary Jurisdiction. All Justices and Board members must be eunuchs (if male) or artificially or naturally postmenstrual and sterile (if female), may own no amount or kind of property that a jury deems "unreasonable", must dispose of any properties that will create an imminent conflict of interest, and must recuse themselves from any legislation or cases that create a conflict of interest. They may not reproduce themselves in any fashion. The purpose of all this is to minimize potential biases, conflicts of interests, and motivations to use the Rings to expand power. (A digital protocol would be ideal if human judgment were not required to render verdicts and define new franchises). The Articles state that all the jurisdictions and armed powers shall be auctioned off to the highest bidder as franchises. There would, for example, be Army, Navy, and Air Forces franchises empowered to charge a reasonable fee to the entire island for their services. There would be some public nuisance suppression franchises: for example there could be an air pollution franchise, allowing the franchise owner to regulate all pollution in Juristopia, similar to the U.S. EPA today. These franchises might be further unbundled into the particulates franchise, the sulfur dioxide franchise, the carbon dioxide franchise, etc. -- or alternatively the car tailpipe franchise, the electric plant emissions franchise, etc. These franchises would be allowed to auction off tradeable emission rights, or altenatively to charge emission fees. To the extent franchises are monopolies, or coercive, or both, the fees they can charge are limited to what are "reasonable" fees as determined by juries. The Articles restrict the Extraordinary Court's jurisdiction to appeals in certain narrow (extraordinary) areas: choice of law and forum clauses, cases involving the property rights of franchises, and cases involving violations of a Bill of Rights, which would also be part of of the Articles. The Bill of Rights states a number of individual procedural rights, such as right to trial by juries, the right of juries chosen by a lottery of taxpayers to decide whether any taxes or franchise fees are reasonable, limits on search, seizure, and arrest, and so on that must be respected by any entity exercising a judicial or police power. All Ordinary Jurisdictions are auctioned off to the highest bidder and can be freely traded. Among the Articles of Incorporation would be a strong requirement that Choice of Forum and Choice of Law clauses in contracts be enforced in a way much broader than current U.S. practice (e.g. allowing all torts of any kind between the two parties to be included in the scope of choice, overriding any franchise jurisdictions). In the expanded form I propose, these will allow pairs of persons (individual or corporate) to opt out of the franchise that would otherwise have jurisdiction over future cases between them. This introduces a substantial degree of competition between franchises, and one might be able to assemble an AC-style system of insurance/protection companies from such clauses. Under the Articles there are no Chief Justices, Presidents, or other lead executive officers that have special constitutional powers. Any Commander-in-Chief of the Armed Forces is optional and would be chosen by the various armed frachises themselves, as they may agree. The Court and Board are free to elect nominal leaders for administrative purposes if they wish. The biggest open problem in Juristopia is how to stop the Extraordinary Court from cleverly interpreting the Articles of Incorporation to usurp the Ordinary Jurisdictions that properly belong to the franchises. Or from just using its control of the Rings to blatantly violate the Articles and enforce martial law and slavery for its own grand benefit and everbody else's pauperization, once enough people have settled on the island with high exit costs. A possible solution might include giving Extraordinary Juries, selected by lottery for each decision, their own set of Contempt of Jury Rings to enforce jury restrictions on the Court and Board. I have also neglected powers to make and enforce treaties with other governments. Since such treaties typical assume external sovereignty, the very low degree of internal sovereignty in Juristopia, which is otherwise a very good feature, may pose an interesting problem for treaties. (N.B. : I crudely described a previous version of Juristopia here). There are a number of modern mythologies that severely disturb our ability to think clearly about law and politics. They encourage lawlessness by sowing confusion about the law. You may have learned them from high school civics class, or from newspapers, or from your friends. Indeed, almost all of us take them for granted, even though they are as fuzzy and false as the tooth fairy. These statements and phrases are legally meaningless and politically muddle-headed, but people often utter them as if they were as obvious as the sun in the sky. (1) "...the government..." -- But there is no such thing as the government outside of a totalitarian government like Stalinist Russia. (Actually, even Stalinist Russia was divided into Republics). In the U.S. we have a federal government, state governments, counties, cities, transit districts, and so on. Mall security can arrest shoplifters and in many states the resident of a house can legally shoot burglars. None of these have arbitrary power, although people often think or act as if states or the federal government or the President himself do or should. This phraseology is related to the totalitarian doctrine of internal sovereignty. Besides federalism and separation of powers, another historical way to avoid this totalitarianism was jurisdiction as property. A related myth I hear comes from my fellow American civilians whose commutes are too long. They have drunk too deeply of the talk radio kool-aid and call President Bush "our Commander-in-Chief." If you check the U.S. Constitution, you will see that President Bush is Commander-in-Chief of the U.S. armed forces only. This phrase, with "the government", may reflect overuse of a biological instinct to think we live in one tribe and follow a single tribal alpha male. (3) "It's the will of the people" -- But who are "the people"? By what magical group mind and group mouth do they express their "will"? This is another phrase that is legally meaningless and politically muddle-headed. There are a number of related nonsense-phrases, e.g. "the consent of the governed", used as a justification for enforcing oppressive laws on the many persons who did not consent. So why follow the law, besides the obvious utilitarian considerations like not wanting to be punished? We should follow the law for the same reasons our ribosomes follow our genetic code. Both law and the genetic code are inherited information that we need first to survive, then to thrive. They are both often highly evolved, with highly improbable functions that are often difficult or impossible to understand. Laws are blueprints providing the basic structure for social interactions, just as genes code for the interactions between cells and even some of the basic interactions between individuals. To the extent political nonsense-phrases interfere with a clear understanding of the law and law enforcement, they destroy what many millenia of cultural evolution has built. (This post was proximately inspired by discussions I have been having with one Mencius Moldbug here, here, and here). Unenumerated welcomes two guest bloggers for this summer. Mark Miller is a computer scientist who has been involved in the Xanadu hypertext project (a precursor of the Web), agoric computing projects, the E programming language, and much else. Jon Roland is an expert on the U.S. Constitution and related legal topics. If you love Unenumerated, have some good ideas, and would like to guest blog this summer, please let me know. The fun new blog involves Mencius Moldbug and the political idea he calls "formalism", which bears some resemblance to the idea of property in everything. There is a problem in what name to give the topic of this post. Perhaps the best name is "digital private law," but this might invoke in the mind of the reader laws passed by politicians to regulate private computers, and that is practically the opposite of the meaning intended. Instead, our topic is digital code that augments or even replaces the functions of traditional private law: contracts, property, torts, etc. -- i.e. almost any law that is traditionally settled in a private lawsuit rather than by a criminal prosecution. Since most of the inspiration so far has come from the English legal tradition, it might also be called "digital common law." Or we might simply call it "smart law" in parallel with coinages like "smart weapons" and "smart contracts." Or "law in a box" or "law on your lap." Mark Miller has captured the spirit, with perhaps some utopian exaggeration, with his slogan, "computer security is the future of law." Lawrence Lessig has colorfully called such digital code "west coast code" (drafted by hackers in Silicon Valley and Seattle) in contrast to "east coast code" (drafted by lawyers in Washington, D.C.) This short-shrifts the many talented east coast computer programmers and west coast lawyers, not to mention all overseas lawyers and programmers. But it helps to clarify my topic by noting that it corresponds to Lessig's "west coast code." Digital private law is also private law in the sense that contracts, property deeds, wills, and so on are private law. In contrast to statutes, regulations, and judicial precedents, they are drafted by private persons rather than politicians or government bureaucrats. Of course, governments could also draft digital code for private use (either voluntary or compulsory), but in the absence of a strong need for a trusted third party to enforce the rules -- which digital security codes can greatly reduce -- there will be much less need for this than there is for governments to operate courts, police forces, armed forces and the like to enforce traditional law and beat up on plenty of innocent people in the process. Digital private law replaces, where appropriate, the threat of violence, and both the flexibility and corruptibility of human judgment, with the utterly peaceful and predictable -- but at times naive, adhesive, strict, and harsh -- operation of digital code. Digital private law, smart contracts, and the like are metaphors (using traditional legal code as a model for digital code), but they are also much more than metaphors -- such code can augment and increasingly, in some cases, will come to replace traditional legal code. They take the form of network protocols inspired by legal metaphors and implementing some of the functions that law has or could serve. Smart contracts allow a new freedom of contract that is no longer possible, if it ever was, with traditional law. Secure property titles will allow more secure and more fine-grained recording and transfer of property rights, while RFIDs are enhancing and proplets will further enhance the protection of those rights. In general, digital security protocols, especially advanced cryptography, allow radically enhanced or utterly new kinds of security that were impossible and unthinkable, and indeed seem quite magical, from the perspective of traditional law and paper security. The raw power of computer to crunch numbers, combined with artful new ways to draw preferences from users and represent them digitally, may also overcome the mental transaction cost barrier to very complex terms and very fine-grained transactions, opening up a potentially large new economic space now crudely occupied by resource allocation algorithms. Besides digital security and user interface design, the theory of digital private law involves much economics, not coincidentally of the law-and-economics kind -- ideas drawn from this area such as transaction costs, value measurement costs, the low-cost avoider, and so on loom large in thinking about these protocols. "Secure Property Titles with Owner Authority"
"The Idea of Smart Contracts"
"Smart Contracts Reduce Mental Transaction Costs"
"Smart Contracts Expand Credit Opportunities"
"From Vending Machines to Smart Contracts"
"Scarce Objects and Market Translators"
"Multiparty Secure Computation" -- a very powerful and general protocol that can provide radically new privacy functions enabling confidential bid auctions, confidential auditing, etc. Even all this is just the tip of the iceberg. TipIt proposes to include a content aggregation feature showing the best-tipped pieces of content, since a tip is more credible than your typical content vote on an aggregator like digg or reddit. This suggests to me an even bigger idea: to provide similar incentives for Internet tipping as we have for tipping at a dinner out -- to make it an expected social practice -- combine tipping with content aggregators like reddit or digg or socializing services like facebook with features as described below. With content we don't know how much it's worth until we've already consumed it (a classic measurement problem). A tip would solve this problem, but a tip is a social thing and requires more than just a payment. If I were doing TipIt I'd change the design in four ways. First, I'd add generosity signal features that inform one's friends or fellow tippers as well as the tipee about the tip. This could be in the form of aggregator "karma" points that name and ranks the most generous tippers. This would be like the "karma" points which people who add content to a social aggregator compete for, but it signals far more -- it signals that one is a generous tipper as well as a generous contributor of reccomendations. There are a variety of other ways (home or facebook pages, e-mail, etc.) that generosity signals might similarly be sent within a social circle. Secondly, I'd add it to an existing aggregator rather than starting a whole new service from scratch. Fourth, I wouldn't try to aggregate "microtips." I think these will have the same kinds of problems that micropayments have. Instead, I'd make the tips nice round numbers in increments of 50 cents or a dollar. That makes it simple for people to keep track of their own tips and their friend's tips. Your client software (perhaps just a web page script) pays the tip (using an already existing system like PayPal) to the content provider, perhaps via the aggregator, and publishes a cryptographic proof that you made the tip. The aggregator verifies the proof (if it's not the payment intermediary it does this by cross-checking with the tipee), registers the vote, and shows that you made the tip. This signals to others both that the content is appreciated, that you are a generous tipper (thus transporting the social incentive to tip from dining out to the Internet), that you have good taste, and that you put your money where your digg vote is. Optionally, it could publish a bit of HTML code on the tipper's own blog or home page, that links to the aggregator and shows how much a person has tipped. It could send out e-mails to the tipper's friends recommending the content and, along the way, informing the friends of the generosity of the tip. If content tipping on the Internet will work at all -- and given the measurement problem of content it would be very nice if it would work - I think it's much more likely to work well if done in a social fashion like this. Clay Shirky describes how micropayments proponent Scott McCloud seems to have thrown in the towel, and he points to my old micropayments paper. A few comments on Shirky's excellent description of the micropayments problem and on my old paper may be in order. When I wrote that paper I thought of micropayments as payments of a granularity smaller than the 1 cent granularity of traditional prices, or very close to it. My prediction was that the granularity of payments on the Internet would be somewhat higher than traditional price granularity. This was in a response to the fascinating Digital Silk Road/Agorics idea that you could buy and sell IP packet transmission, memory space, and the like at unprecedentedly low granularities like a thousandth of a cent. There is basically no important computational transaction cost barrier to such payments, but I described mental transaction cost barriers that still have not been surmounted. The efforts of micropayment engineers focusing on computational rather than mental transaction costs were and are misguided. So when the Post Office raises postage rates by 1 cent, or charges a few cents more for one class of mail than another, that's very close to what I thought of as a micropayment and is what I was predicting would be very hard (not impossible) to do productively on the Internet. But when iTunes sells a song for a dollar, regardless of how popular the song is, that's a price granularity that is sufficiently high to overcome mental transaction costs. Nowadays many people call even a dollar a "micropayment" because it's smaller than your typical credit card payment, and this muddles the issue. Paypal and some services like iTunes have shown that there's at least a significant niche market below typical minimum credit card payment, but it hasn't shown that micropayments of the kind I talked about are feasible. I don't claim that price granularities of near 1 cent or below will never make economic sense on the Internet, but they do require a sophisticated attention to preference revelation and mental transaction costs that so far has generally been lacking. Something like micropayments, or at least low-granularity accounting, is happening on the advertising payment end rather than the consumer payment end. The business of selling eyeballs wholesale is much better able to automate the sophisticated accounting and auditing that is required for such schemes to work. Some proxy measures for eyeballs, e.g. based on "hits", have proven to be feasible when computers rather than humans can reliably do the counting at any granularity below thousands. Arguably some online games have also achieved low price granularities, although here payments are part of the entertainment value of the game (as in traditional games like Monopoly(tm)) rather than just a necessary transaction cost. The extent to which iTunes and the like can compete with free content is another issue which Shirky describes well. This competition interacts with price granularity insofar as the mental transaction costs put a floor on content prices and competition from free content (artists seeking fame rather than money) puts a ceiling on content prices. Shirky plausibly argues that there is little or (ultimately) no room in between this floor and ceiling leaving little and perhaps ultimately no significant market for online content funded directly by the consumer. (1) As more low-wealth people get on the Internet, price granularity will naturally fall as such consumers are generally willing to put more effort and attention into shopping per money saved. Much of the reason price granularity has been higher on the Internet is because its users have higher than average wealth. However, unlike point (2) below this effect is not very large and won't by itself get us below traditional price granularities. (2) Where the mental transaction/preference revelation problem can be solved for high-wealth consumers at 1 cent granularity for a particular kind of Internet transaction, there is nothing magical about 1 cent, and it might well be easy to further reduce price granularity to a thousandth or a millionth of a cent. In that sense I'm a big fan of the agorics approach -- since "micropayments" has been taken to include much larger payments perhaps we could call them "nanopayments" -- and I hope I haven't overly discouraged people from looking at these fascinating and potentially quite lucrative and revolutionary possibilities.